After a successful concert in 1814, Beethoven was out for a walk on the Kahlenberg above Vienna when he met two young girls who gave him some cherries. His offer to pay was declined by one of them with the rejoinder: ‘I’ll take nothing from you. We saw you in the Redoutensaal when we heard your beautiful music.’ This is just one of the many illuminating episodes in this long but generally enthralling and stimulating book. The anecdote has the advantage of being both genuine and one of Beethoven’s favourites, as well it might have been. 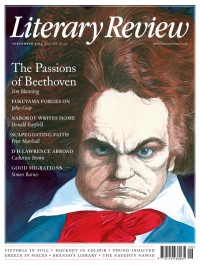 Today, when the gulf between contemporary classical music and the great majority of the population has never been greater, it is salutary to be reminded of just how popular Beethoven was. When the Seventh Symphony was premiered in 1813, for example, the audience insisted that the slow movement be encored in its entirety, a demand repeated at many subsequent performances. Some of the later works, notably the string quartets, may have been met with incomprehension but he was undoubtedly a hero in his lifetime.